Historic homes have many lives pass through them, and Nyrambla is no exception — it has witnessed death, divorce, fire, indiscretions, joy, tragedy, war. This old home is one of Brisbane's most interesting buildings, as it is an unusual mixture of the known and the unknown. Over the years its occupants have ranged from the famous to the obscure, and as Matthew Condon noted it has witnessed a myriad of life's stories. 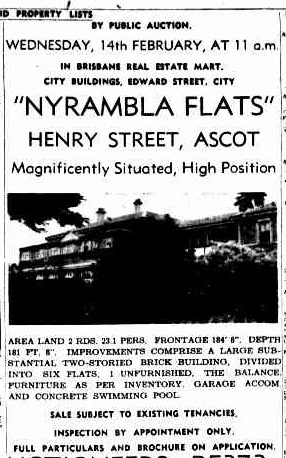 Nyrambla sits in a leafy Ascot enclave surrounded by some of Brisbane's most expensive houses. These days it is barely visible from the street, shielded from curious eyes by surrounding residences and a camouflage of trees and greenery. Here is an aerial view of the property. The house was designed by early Brisbane architect James Cowlishaw and built way back in 1885 for bank manager Henry P Abbott; standing then on 15 acres of prime real estate most of which was split off over ensuing years as suburbia encroached on the site. The original owner is remembered in the surrounding streets named Henry and Abbott. The house itself is an imposing two-storey structure surrounded by expansive verandahs. Originally it had stables and servants' quarters and over the years a swimming pool and tennis court were added. 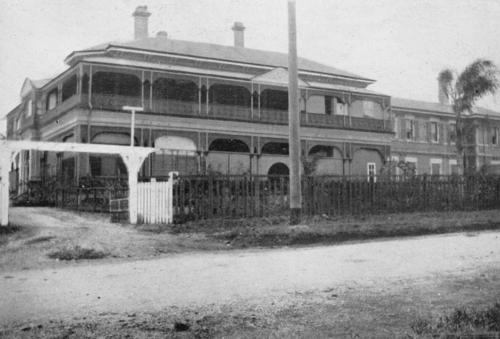 The following is a photograph from 1922 taken from Henry Street, now the main entrance to the property. 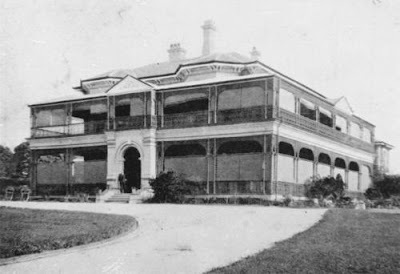 And the next image, taken in 1932, shows the former front view of the house taken from Yabba Street. When Mr Abbott retired he and his family moved to Sydney and Nyrambla was rented out to well-to-do tenants including the famous Queensland brewer Patrick Perkins, the original Mr Fourex. Around 1925 it was purchased by Mr GW Whatmore, who was the managing director of an automotive group that sold Austin cars. He was also an alderman on the Brisbane City Council, and was formerly a champion cyclist, rower and yachtsman. After he died in May 1929 at Nyrambla, the large house was converted to flats. The architectural work was done by the prominent firm of Hall & Prentice and the conversion by builders Cunningham & Jones. 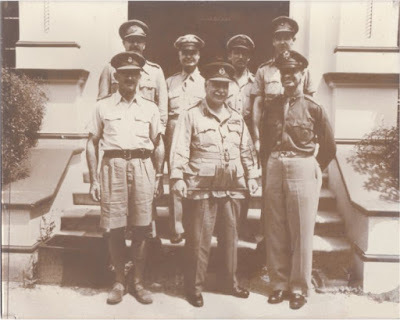 During WWII when Brisbane was host to General Douglas MacArthur and tens of thousands of American troops, Nyrambla was requisitioned by the Allies and became one of the most important locations of the war in the Pacific. And a top-secret one. At a recent reunion some of the personnel involved remembered those war years as recounted in this excellent ABC piece run by Radio National on 10 July. For about three years Nyrambla was the home of Central Bureau whose job it was to decode Japanese radio transmissions. Here is a photograph of a commemorative plaque that now adorns the front of the building. 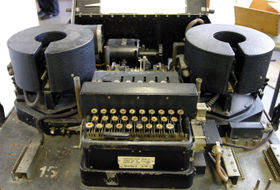 In the garage of Nyrambla enemy messages were decoded and retransmitted to Allied bases around the world using the Typex machine, a rotor machine similar to the now-famous Enigma.This is what a Typex looked like. 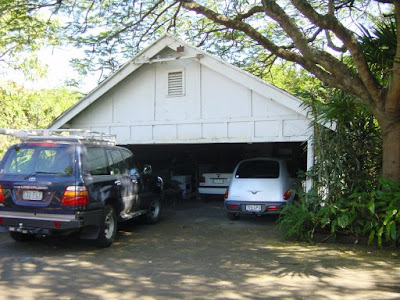 And here is a picture of the humble garage/bunker where the "garage girls" operated the Typex machines. It has now reverted to its original purpose. 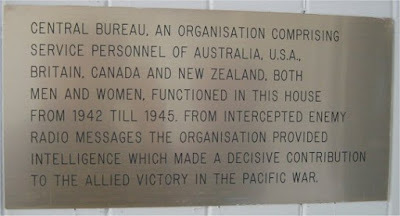 There are claims that Central Bureau intercepted and decoded a Japanese signal that led to the ambush and death of Admiral Yamamoto, the architect of the Japanese attack on Pearl Harbor. The importance of this Brisbane site was emphasised by visits from MacArthur and also the Australian General Thomas Blamey, who is pictured below at Nyrambla on 25 February 1944. 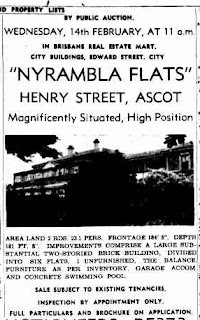 After the war, I assume Nyrambla returned to its peace-time role, operating as six flats. It was offered for sale at auction in February 1951. Over the years since then the old house has seen a number of inhabitants, some of them quite well-known. I understand former ABC presenter Blair Edmonds lived there as did media personality and operator of farmers markets, Jan Power. Prominent Queensland actor, director and writer Bille Brown was a long-time resident prior to his death in 2013. Nyrambla is listed on the BCC heritage register, and it states there that the building has been converted back to a private residence. The Matthew Condon article in The Courier-Mail that was quoted at the top of this piece goes on to mention the owner (in August 2014) as being "Brisbane socialite" Andree Whatmore, the grand-daughter of previous owner, businessman George W Whatmore! Andree Whatmore and her husband Lawrence Daws, the famous artist, now reside at Nyrambla. Thank you Peter. I hope the blog continues to hold your interest.